Free "Tips" from UniqueTek, Inc. Tips File #19: "Empty Case Bin Mod for the RL 550 Press"
This "Tips" describes how to make a DIY version of the Dillon Cartridge Case Bin & Bracket. 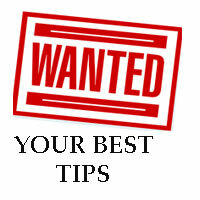 Note: All "Tips" files download in PDF format. "Tips" files are in PDF format, so you need Adobe Reader to open and read the files. Downloaded for free from the Adobe web site. "24 Tips for Powder Measure Accuracy"
"14 Tips for Electronic Powder Scale Accuracy"
"12 Tips for Steel Challenge Competition"
"Using Clay Target Hangers with a Target Stand"
"Using a Dillon Powder Check on an RL 550B Press"
A "Guest" Tips file by Jason Giglio of Ballistic Tools, Inc.
"Die Shims and Die Spacers"
"Empty Case Bin Mod for RL 550 Press"
We are always looking for new "Tips" files to add to our library. We welcome our customers to submit their own tips files, or ideas for tips files, for potential publication on the web site. Just send them to me in an e-mail or call me at 480-507-0866. You can also fill out the form below, then click the "Submit" button to send. Just wanted to compliment you on your 20 Tips article ["20 Tips for Powder Measure Accuracy"] - it was well written, full of great tips (some I've already implemented) and shows expertise! The best part is that it wasn't just a tool to sell me your product (although there are a few items I'm on my way to buy)… Thank you! I am writing to thank you for sharing your tips files with me. So far I have only read a few (#1,7 and 9), but the quality and clarity of the content has been excellent. Thank you very much for sharing this tremendous resource with a fellow shooting enthusiast. Thanks for the [Tips] files and for all you do to help us become better at reloading and enjoying this sport! Keep up the great "Unique" equipment line and the great tip section. They have been extremely helpful. I have downloaded your "Tip" file "18 Tips for Powder Measure Accuracy", and found it not only well written, but containing invaluable information. I strongly suspect the above files [other "Tips" files] will be similar. Thanks in advance!! !